I am a huge fan of My Little Pony, as is my little girl, who wouldn’t be? I remember back in the day spending hours with my My Little Pony stable and now I can share that love again with Aria. Back to school is in full swing and what a great set Twilight Sparkle Magical School of Friendship is. Perfect for this time of year. It is suitable for ages 3 and up so it would make a great back to school or starting school gift. 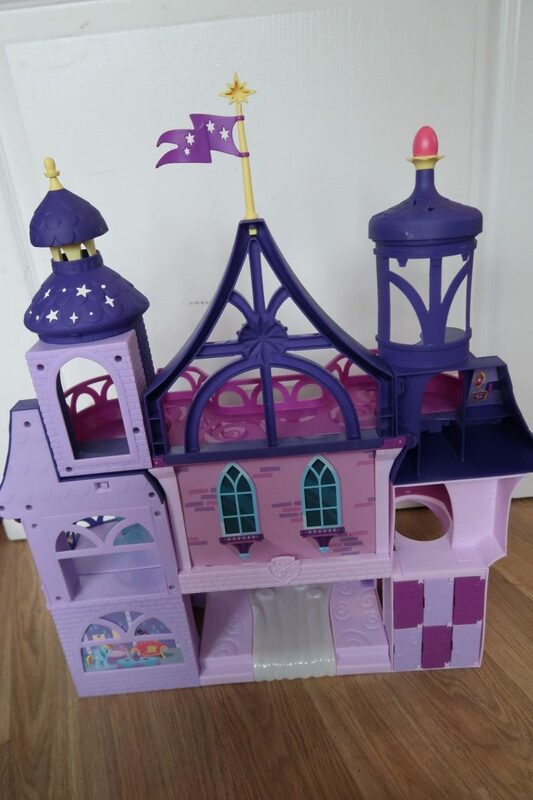 Upon opening the box, you will see that the castle comes in parts and you have to piece it together. Now, the instructions are clear and so clear in fact that I left my 5-year old while I made the dinner, telling her I’d help when it was ready. I came back into the living room and she’d built the entire thing herself. Can you believe it? 15 minutes or less and she’d build the entire thing. The instructions have pictures on it which help massively. I only helped her with the stickers and the batteries. I do like to make sure the stickers are on the right place and not squint. Anyone with me on that? There are lots of different sections to explore in the set. it is a total of twenty-two inches and has three layers. 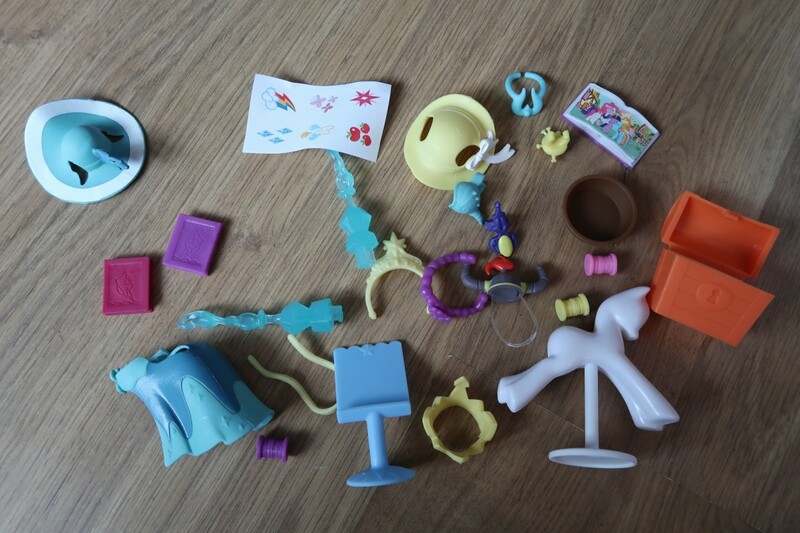 Each one has a different area to explore with your My Little Pony. This is the back of the castle and above the front. There are a few different My Little Pony’s to collect, but the My Little Pony Twilight Sparkle Magical School of Friendship comes with a 3-inch Twilight Sparkle. She also has her own accessories. 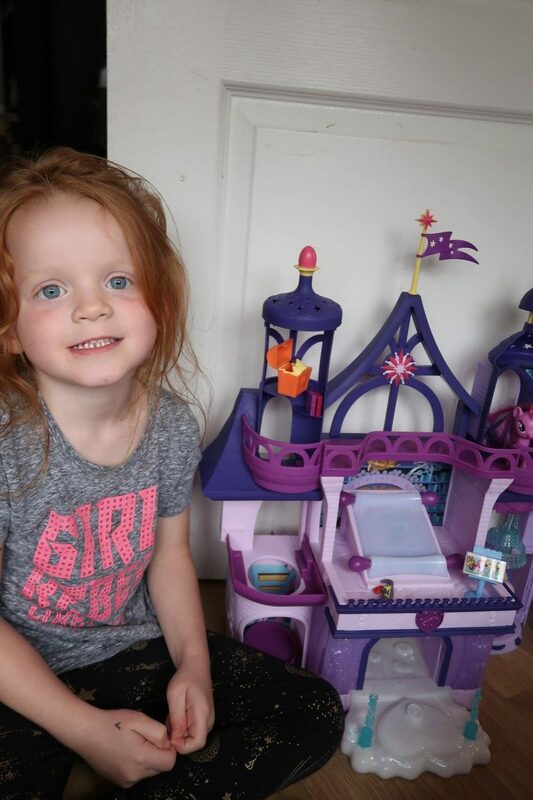 The set comes with 24 additional accessories ranging from a pony mannequin, books, costumes, crowns and much more. Allowing their imagination to soar. Once the batteries are in place, there are lots of different sections that bring this school of friendship to life. The scroll in the middle of the school, when turned it lights up displaying various different images of My Little Pony Friendship adventures. 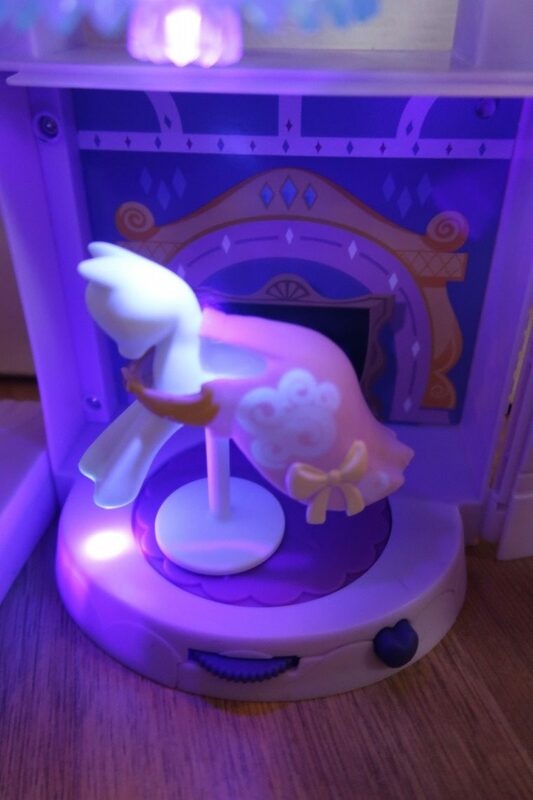 Our favourite feature is when the mannequin or a My Little Pony figure is placed on the carousel with the chandelier and it lights up, cascading patterns on to the pony’s and costumes below. It really does look magical. 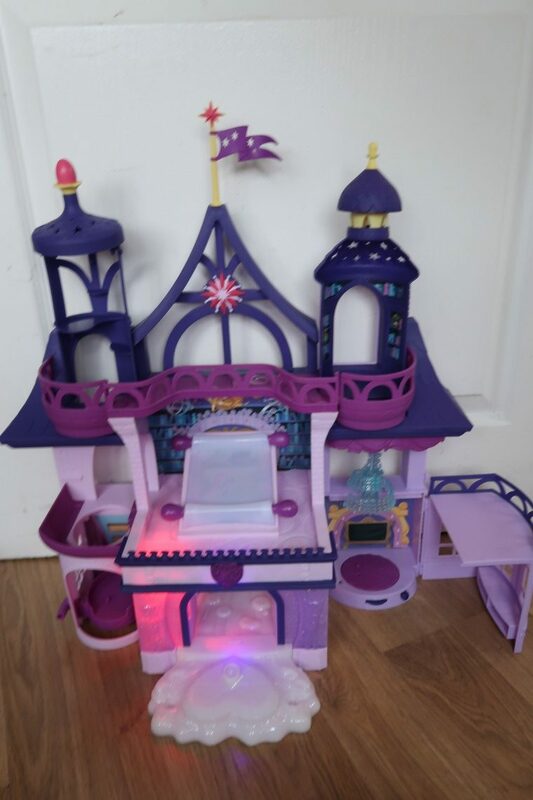 The My Little Pony Magical School of Friendship has lots of different parts that create lights, sounds and music. 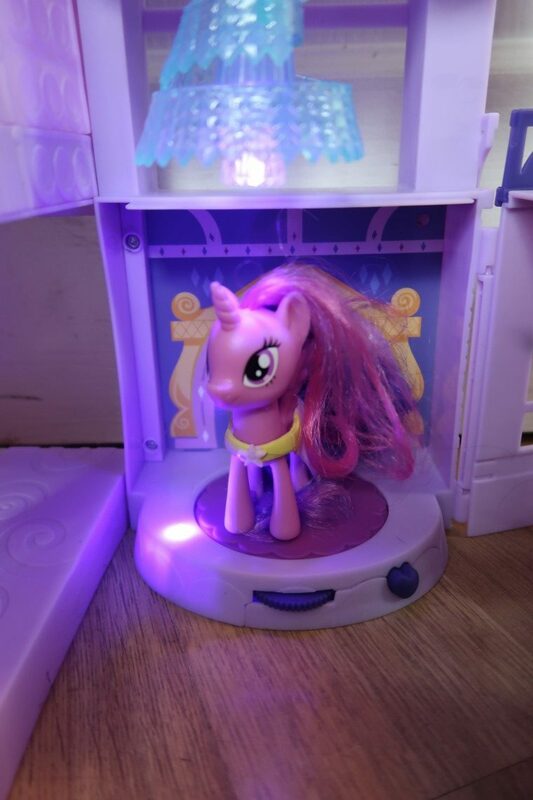 When the doors are opened, a pony stands at the entrance to the school whole things lights up and the My Little Pony tune plays along with some magical sounds. It is a lot of fun and really brings the imagination to life. 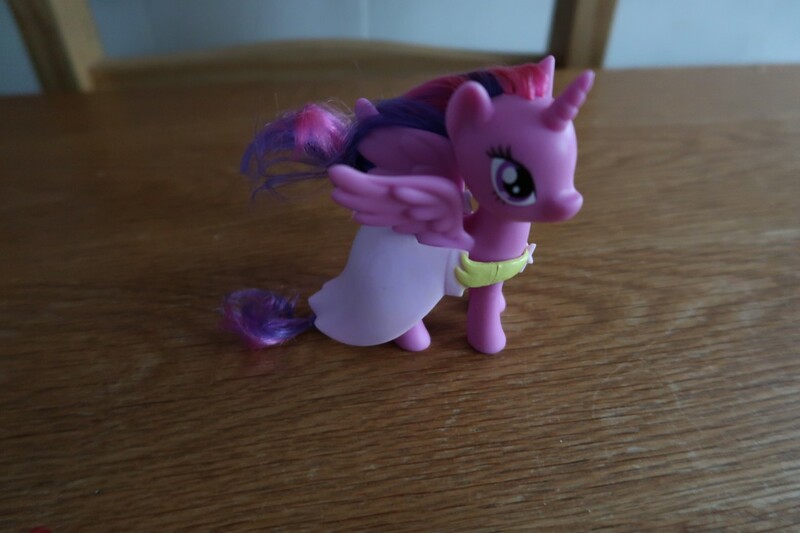 The different Ponies can stand and be dressed up and spin around. There is also a lift to take them up to the higher part of the school. 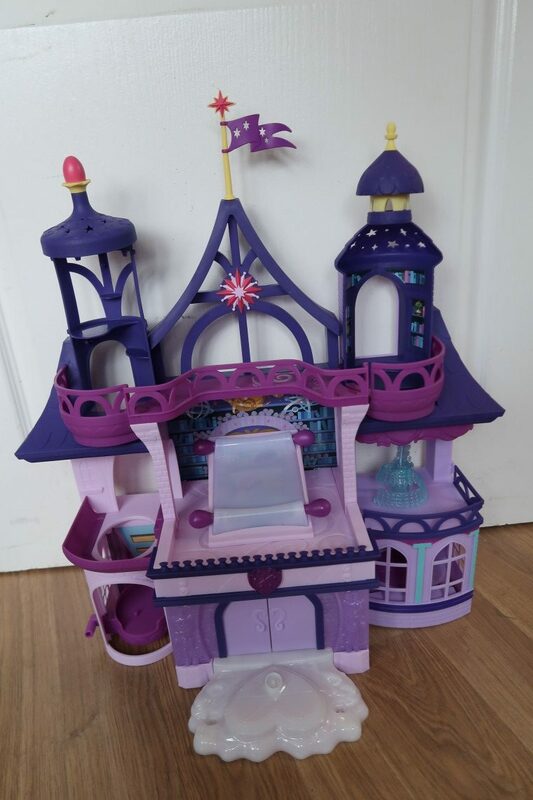 There are other My Little Pony’s which work with this playset and can be purchased separately, but we used a few we already had around the same size and they worked well. But, I know the ones that go with the school are high on the Christmas list. 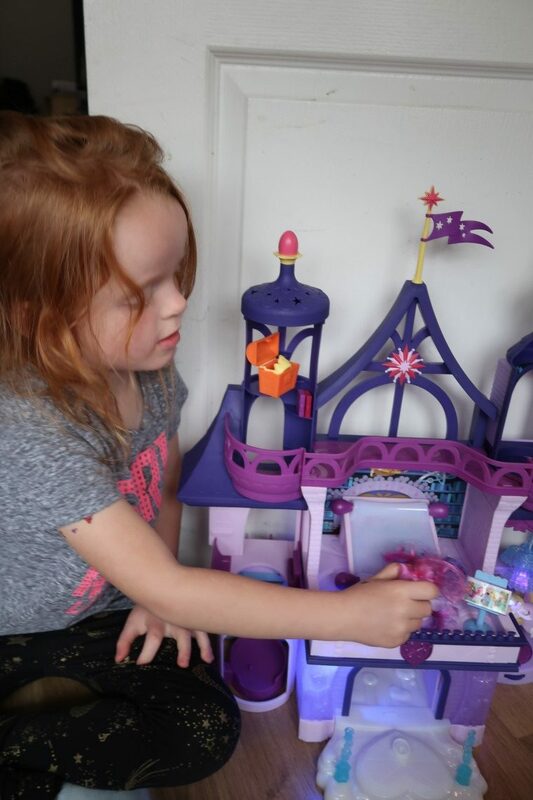 We love the My Little Pony The Magical School of Friendship it is a great playset which is fun and encourages kids to expand their role-playing and imagination. I love the dress up section that is like a wee fashion design station for pony’s it’s so cute and they even have a tiny sewing machine, ribbon and thread. The attention to detail is fantastic. We are huge fans of this set. It has a lot of features that keeps Aria going back for more and the lights and sounds add to the excitement. There are lockers at the back of the castle which you can keep the little pieces within. Plus you can expand for the set. 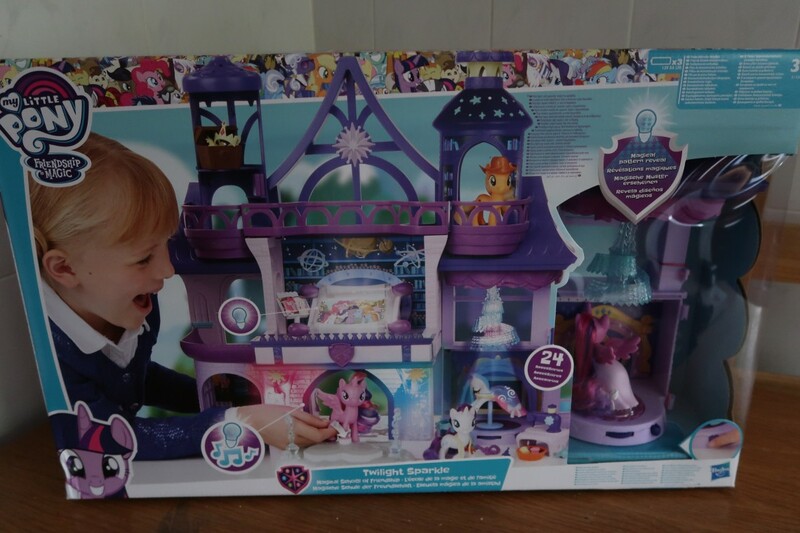 With an RRP of £59.99, it’s not the cheapest playset, but there is a lot you can do with this and it is My Little Pony after all. A brand that has been about since I was a little girl. We have enjoyed playing with this set and it’s one that gets continued use. It would make a great Christmas gift for a little fan. 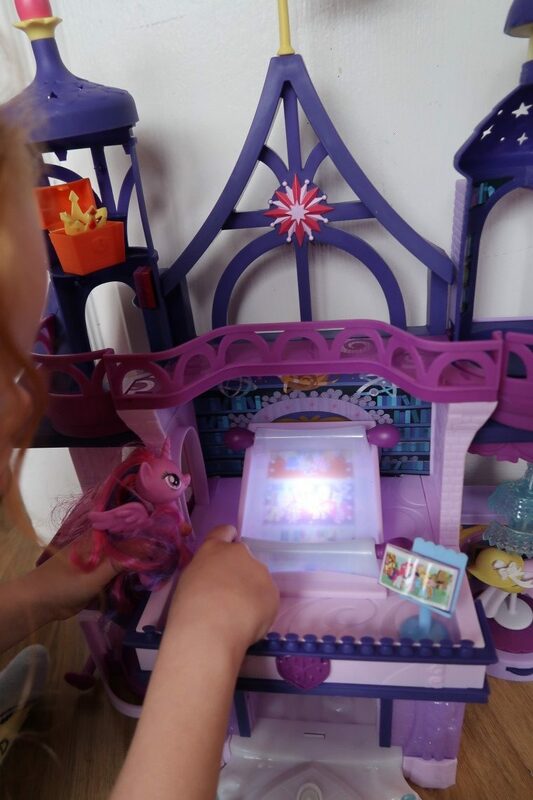 Disclaimer:- We were sent the My Little Pony set for the purpose of this review, but all words and opinions are my own. I would have loved something like this when I was little. I was a big My Little Pony fan. This is so cute. 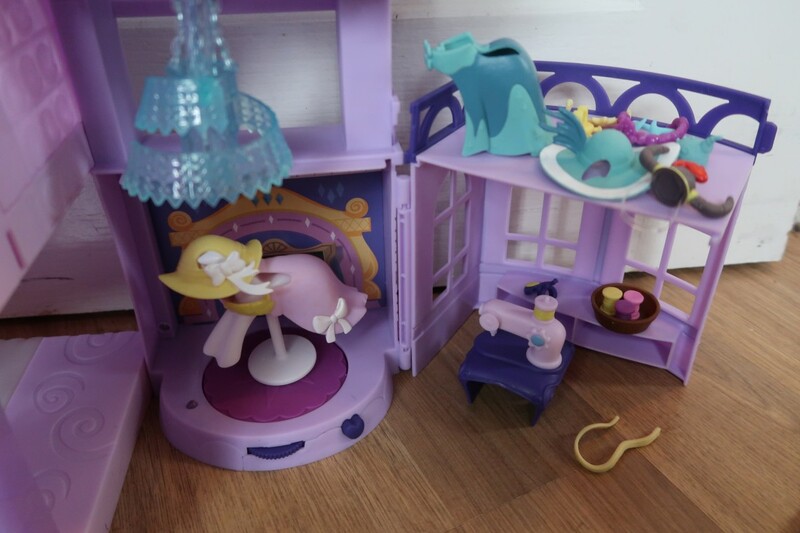 My daughter used to love going to her cousins house when she was younger as she had so many ponies and they used to play for hours. It looks and sounds fabulous 👍will recommend to the parents.